The foundation of Roger Penske’s racing success is without a doubt, his NTT IndyCar Series operation. Team Penske has won 15 Indy car championships, 17 Indianapolis 500s and 203 Indy car races – all records in the history of the open-wheel, open-cockpit racing discipline. Penske, however, is a legend who has achieved great success in other forms of racing. His operation has amassed 34 championships and 505 total wins in all forms of motorsports. The man synonymous with Indy car success was honored Friday night for his accomplishments in another form of auto racing, when Penske was formally inducted into the NASCAR Hall of Fame. Four-time Indianapolis 500 winner Rick Mears, three-time Indianapolis 500 winner Helio Castroneves, 2014 NTT IndyCar Series champion and winner of the 102nd Indianapolis 500 Will Power and Team Penske President Tim Cindric were among the large Penske contingent in attendance at the induction ceremony held at the Crown Ballroom of the Charlotte Convention Center. Penske is part of a NASCAR Hall of Fame class that includes five-time Brickyard 400 winner Jeff Gordon, 1992 Cup Series champion Alan Kulwicki, former star Davey Allison and fellow team owner and racing industrialist Jack Roush. Penske, though, is the first true Indy car competitor of the 50 enshrined into NASCAR’s Hall of Fame. Comedian Jay Leno, former host of “The Tonight Show,” played host again, this time to preview an introductory video of Penske. “Roger, congratulations on your induction into the NASCAR Hall of Fame,” Leno said. “There is an old saying that you never want to meet your heroes, but boy, that could not be further from the truth. “Meeting you and shaking your hand is one of the seminal moments of my life. Penske’s induction video was introduced by Team Penske’s NASCAR drivers: 2012 Cup champion Brad Keselowski, 2018 Cup champion Joey Logano and young star Ryan Blaney. “He’s known as ‘The Captain,’ but to us, he’s also known as a mentor, a fierce competitor, a role model and a great friend,” Logano said. “He’s a true titan of industry and a leader of advancing the popularity of motorsports for over 50 years as a team owner, track owner and even a driver,” Blaney said. “His contributions are many and his mark everlasting and, tonight, he takes his rightful place in the NASCAR Hall of Fame,” Keselowski said. “This Hall of Fame honor and this moment is very special to me, and I am so glad to share it with my family and friends,” Penske said. “Racing has been a part of my life almost as long as I can remember. It is a common thread that is woven throughout all of our Penske business. “Racing is simply who we are. The lessons we learn in racing drive our success in business and the exposure is a source of pride that builds our brand throughout the entire organization. Penske recalled one of his early days as a driver when he won a NASCAR race at Riverside International Raceway in California in 1963. “The purse was $3,300 and a Rolex watch,” Penske recalled. “That was a pretty big deal in those days. “Unfortunately, NASCAR and USAC were big competitors at that time. Because I had crossed the boundary between the two sanctioning bodies, USAC fined me $250 and also suspended me for 30 days. Penske told tales of his team and how it helped his vast business empire grow. He also thanked a long list of individuals who work for him and helped him get to this moment. “As proud as I am about our past success, I’m also excited about where we are going,” Penske said. In addition to his team’s unparalleled success in Indy cars, Penske’s NASCAR accomplishments include two Cup Series titles, in 2012 with Keselowski and 2018 with Logano. The 81-year-old Penske remembered his parents for helping instill the pride and value that has made him racing’s ultimate winner. Team Penske has three full-time entries for the 2019 NTT IndyCar Series for Power, 2016 series champion Simon Pagenaud and 2017 champ Josef Newgarden. Castroneves is also slated to return from his full-time ride with the Team Penske Acura sports car group to again try for a record-tying fourth Indianapolis 500 win in May. The NTT IndyCar Series season kicks off with the Firestone Grand Prix of St. Petersburg on March 10 (1 p.m. ET, NBCSN and Advance Auto Parts INDYCAR Radio Network). 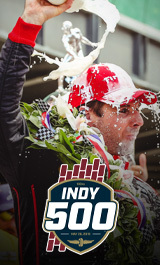 The 103rd Indianapolis 500 presented by Gainbridge is set for May 26 and airs live (11 a.m. ET) on NBC and the Advance Auto Parts INDYCAR Radio Network.